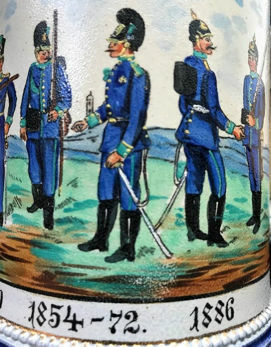 When we look at or collect this type of beer stein, we must keep in mind that they are dating from the era of the German Empire which existed from 1871 to 28 Nov 1918. The Empire came into being in the wake of the victorious Franco-Prussian War of 1870/71, when Prussian King Wilhelm I was proclaimed German Emperor (or Kaiser) on 18 Jan 1871 in the Hall of Mirrors of the Castle of Versailles in Paris, France, while still retaining his function and title as ruling king of Prussia. Germany was then reorganized into an "Empire", i.e. a union of federal states, comprised of four kingdoms (Prussia, Bavaria, Wurttemberg and Saxony), 6 Grand-Duchies (Baden, Hesse, Mecklenburg-Schwerin, Mecklenburg-Strelitz, Saxony-Weimar and Oldenburg), 5 Duchies, 7 Principalities, 3 Free and Hanseatic Towns, plus the newly acceded "imperial lands" of Alsace and Lorraine, which had been reclaimed from France. While the rulers of the existing federal states were retained, a governor was appointed in Alsace-Lorraine. Wikipedia contains an excellent article about the "Unification of Germany." In the military domain, all the federal states eventually concluded so-called "military conventions" with Prussia (the largest of the kingdoms) which meant that they incorporated their military forces into the Prussian Army (introducing the Prussian numbering system for military units) and adopted the Prussian uniform and military regulations. The only liberty permitted was that these federal states could retain some of their traditional military insignia that would distinguish them from others. This is why we find Saxon, Wurttemberg, Baden or Hessian heraldic front plates on the spiked helmets, belt buckles, etc. The only big exception from the aforementioned was the Kingdom of Bavaria, which was not only allowed to retain her own light blue uniform color for her infantry units (left), instead of dark blue for the Prussian units (right), but also to use a different numbering system for her military units, i.e. with the ordinal number preceding the unit designation. For example, the 17th Infantry Regiment would be a Bavarian unit, while Infantry Regiment No. 17 would be a Prussian one. Thus, the Imperial German Army was made up of two entities, i.e. the Prussian Army (which included in her ranks the military forces of all federal states except Bavaria and had subjected them to its specific numbering system) and the much smaller Royal Bavarian Army (which used a numbering system of her own). Also, Bavaria would appoint her own officers and would subordinate her military forces to the German Kaiser ́s overall command only in the event of a war. As a point of interest, it is to be noted that Bavaria only introduced the Prussian style spiked helmet after King Ludwig II's death, i.e. as late as 1886, to replace their "Raupenhelme" or "caterpillar helmets". We see this history in the scene at right, showing the Raupenhelm in use from 1854 to 1872, and the Pickelhaub in use by 1886. The situation was again a bit different in Bavaria, as - after the death of King Ludwig II on 13 June 1886 - his brother King Otto I was unable to ascend to the throne due to a mental illness and was replaced by "Prince-Regent" Luitpold, who ruled from 10 Jun to 12 Dec 1912. After the latter's death, he was succeeded by his son King Ludwig III who would rule Bavaria until the end of WW1. When we now look at the German Empire's surface area, which was once 208,881,000 square miles, it was reduced in size two times, first in 1919 (after WW1) and again in 1945 (after WW2). The surface area of West Germany (1945 - 1990) was less than half, i.e. 46 percent of that of the former German Empire, and that of East Germany only accounted for 19 percent. This means that after the German reunification (as of 3 October 1990) present-day Germany only occupies a total of 65 percent of the surface area of the former German Empire. This, in turn, implies that about one third of the former garrison towns are today situated beyond the German frontiers, i.e. in countries, such as Lithuania, the Russian Federation, Poland, Denmark and France, with their names having been changed completely. A last aspect we should take into account is the fact that many people use the 1914 organizational status of the Imperial German Army, i.e. the last peacetime status, as a reference. This is completely wrong. When we talk about the Imperial German Army, we look at the 1871 thru 1914 period, a span of 43 years, during which countless changes have occurred within the German Army. 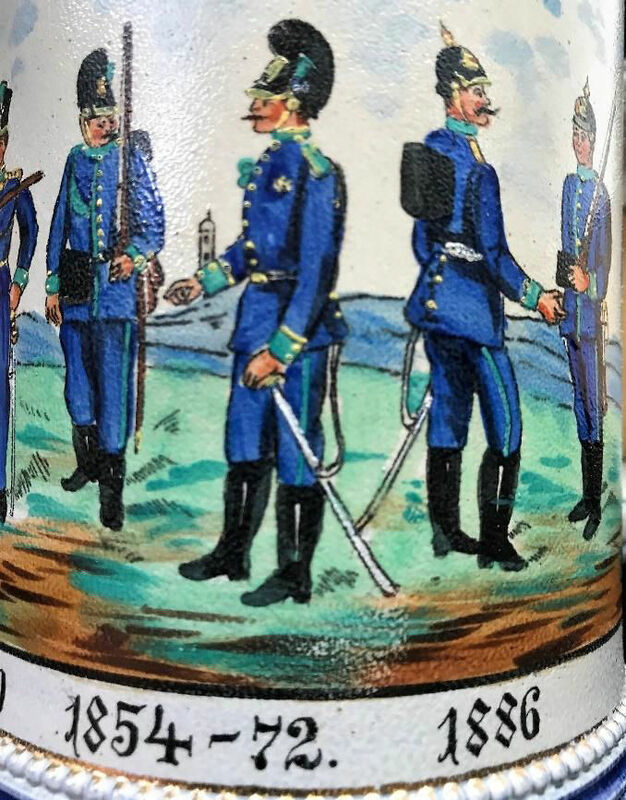 In the process, regimental stein collectors should look at the period 1890 to 1914, respectively. The aforementioned changes relate to name changes of units, changes in garrison towns, changes in uniform details, conferred awards and distinctions etc. The Dragoon Regiment no. 3 named "Neumärkisches Dragoner-Regiment Nr. 3" in 1861, changed its name to "Dragoner-Regiment Freiherr von Derfflinger (Neumärkisches) Nr. 3" as of 27 Jan 1889 and was finally renamed on 22 March 1897 "Grenadier-Regiment zu Pferde Freiherr von Derfflinger (Neumärkisches) Nr. 3". Hussar Regiment König Humbert von Italien (1.Kurhessisches) Nr. 13 was transferred for disciplinary reasons from Mainz to Diedenhofen as of 1 July 1905. The reason was that during the Carnival or Mardi Gras parade some members of the Hussar regiment rode on floats with scantily dressed young ladies and this sparked some citizen protest. Kaiser Wilhelm II then ordered the unit ́s relocation during which the Hussar Regiment changed garrison towns with Dragoon Regiment No. 6. The 15th Royal Bavarian Infantry Regiment whose honorary title always reflected that of the ruling Saxon King, had its name changed no less than six times, retaining as its last name (from 1905 to 1918) the designation "15. Infanterie-Regiment König Friedrich August von Sachsen". Besides that, the Grandducal Mecklenburg Grenadier Regiment No. 89 was the only unit of the Prussian Army in which two different uniforms were worn within one regiment. While the 1st and 3rd battalions of this regiment wore the insignia of the Grand Duchy of Mecklenburg-Schwerin, the 2nd battalion (i.e. 5th thru 8th company) would wear the uniform and insignia of the Grand Duchy of Mecklenburg-Strelitz. In summary, collecting Imperial German militaria is all the more interesting and exciting, if their historical background and context are a bit better understood.